He was there this morning while I rushed around getting ready. We were running out to meet Mac and Julie in Mesa and it seems to take six and a half years to get ready these days. 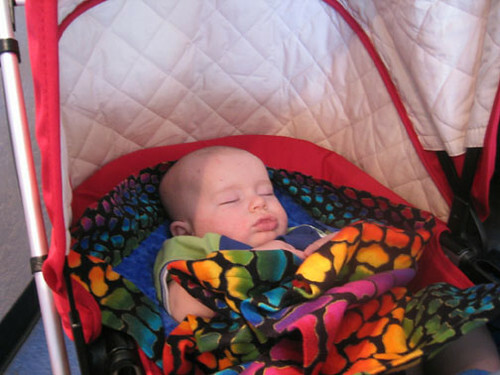 I did get one of Jack sleeping in his stroller. It was nice to get out and spend some time with Julie. It's hard with two new babies and I feel like every time we get together it's hard to talk. Today the boys cooperated somewhat and we got to chat a little and compare war stories. It's funny how much we worried about childbirth and that was the easiest part of this entire process. So Jack is almost 3 months old and he just doesn't sleep at all. I've had many recommendations for how to get him to sleep longer, some of which I have tried, some of which I have not. Apparently the one I am most reluctant to try – feeding him formula at night instead of nursing – is the one that has the most success. But why am I so opposed to formula? Some people are huge supporters of this remedy, and others think I'm crazy for considering it. I can't believe how much opinion and emotion is wrapped up in the feeding of an infant. Isn't the idea to get the child fed and keep the mother from completely losing her mind? So despite this controversy, I will be handing Jack a bottle tonight and keeping my fingers crossed. 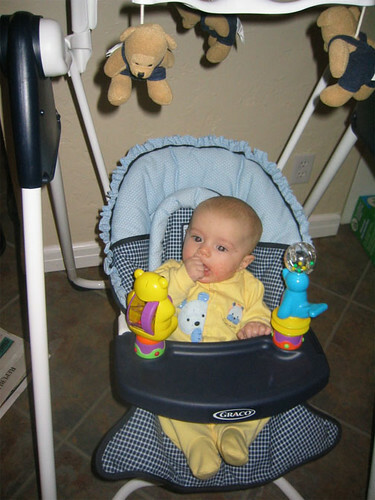 On the teething front, there still is not a sign of a tooth other than excessive drooling, biting of fists, grabbing of cheeks, and general unhappiness. I finally got the homeopathic teething remedies I ordered (my mom's cousin Jan sent her an email about these, they are made by Hylands. I actually had already ordered them, but I'm glad to hear they work for someone else.) I am going to try them with no Tylenol tomorrow and see how they work. Joe is on his way home. Tonight I am actually cooking (I know, shock of the century), so I have to get in the kitchen and get the chicken defrosting. We're having a recipe that is normally called "Chicken and Rice", but since I am on this new diet I will be making it with barley instead. We'll see how it works.